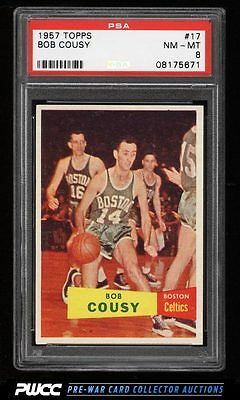 Extraordinary Cousy rookie on the auction block this month. The offered '8' boasts strong NM-MT corners and card stock. Nicely framed with attractive cream borders and crisp edges. A very popular and important Celtic in high grade. Deserving of attention. One of nearly 17,000 cards, lots, and sets up for bid in our 8th Auction of 2016. Click on the link above to view the other PWCC auction lots.